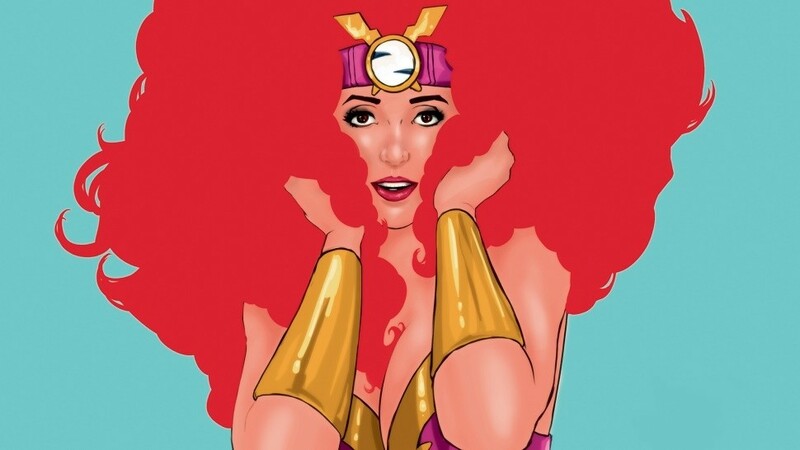 Carlo Vergara gives us our first cover to feature a comic book character and a transwoman. This is the last of a five-part series detailing the artworks on the five covers of our special all-illustrated issue. 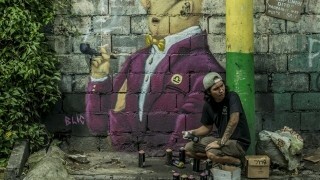 Check out the rest of the features: Blic, Annie Cabigting, Gary-Ross Pastrana,, Derek Tumala. Philippine theater’s loss is Pinoy komiks' gain: His first self-published short comic, One Night in Purgatory, which he wrote and illustrated, was nominated for a National Book Award in 2002. That same year, Vergara completed Ang Kagilas-gilas na Pagsasapalaran ni Zsazsa Zaturnnah, which won a National Book Award in 2003. To say that Zsazsa was successful is an understatement: the character, an amusing take on old komiks tropes—think Wonder Woman and Darna, recast as a transsexual woman—took on a life of its own. Since then, Zsazsa Zaturnnah has been the subject of a number of academic papers, a 2005 musical, and then a movie. There’s been a second comic book, seven stagings, and talk of a second musical. (Vergara also sang on the musical’s soundtrack album.) 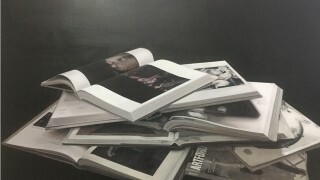 When Esquire Philippines first commissioned him to draw the fashion spread in the all-illustrated October 2016 issue, he was immediately intrigued by the prospect of being able to create a mini-story (featuring some of his beloved characters from Zsazsa Zaturnnah) from scratch—“I want a project to feed my soul,” he said. Halfway into his creating his 12-page beauty, we invited him to push his work a bit further: on to the cover, giving us our first cover to feature either a comic book character or a transwoman. And the rest, as they say, is history. ESQUIRE: Zsazsa Zaturnnah has gone from comic book to stage musical to film to bona fide cult favorite. Is there another part to her story? CARLO VERGARA: I had never intended to create another story for Zaturnnah. I was more into the "self-contained" mindset—I wasn't sure if I could handle a book series. But people asked me for more. So my decision to create Zaturnnah sa Maynila, the second book, was primarily spurred by a demand and taking advantage of a ready market for the character. But, still, I had to make it more than fan service. I wanted to challenge myself, and see how far I could go as a maker of stories. Plus, there's the question of making an English version of the comics. 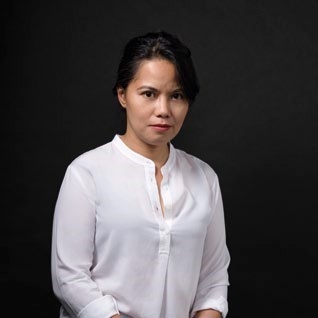 Thanks to Regal Films and Asian film aficionados abroad, Zaturnnah has been getting noticed in other parts of the world, albeit very, very slowly. ESQ: Besides being one of the all-time greatest Pinoy comic book characters, ZZZ has also helped break some barriers. Was this your intention from the beginning? CV: Well, there was the need for a different presentation of the "stereotypical" homosexual character, at least based on the way I've seen gay people portrayed in entertainment media up until the 1990s. Ruel de Vera asked me over a decade ago, "So what does it feel like to be an activist?" That surprised me, honestly. I had never equated what I did as activism. Subversion, maybe. But it was really me asking ‘what if we treated things a little differently?’. ESQ: You also did the fashion spread for this issue. What was your concept behind this fictional photo shoot? CV: When the idea of 'punk' was presented, I immediately equated that with rebellion. Breaking away. Escape. Rejection of what is. Chase. That was my train of thought. But it was only when I started drawing it that I wondered, ‘An escape from what?’ My first thought was technology violating privacy, government monitoring, hi-tech eyes following our every move... things like that. In one of the pages, I added a very blurry cover of Alan Moore's V for Vendetta. I loved that graphic novel. ESQ: What is the "House of Carver"? Who is Carver, and what is his byline doing in our pages? CV: The name of my blog is The Carver's House—"Carver" being the first syllables of my name. When I made my Facebook page, I just switched it around, just for kicks. I honestly have no idea why Esquire chose me to do the fashion pages. I mean, this is Esquire, and my art style is not something one would immediately equate with high fashion. So I'm really, really surprised and really, really grateful. But, let me tell you a secret: many years ago, I fantasized having Zaturnnah in a fashion feature. If the October issue isn't proof of the Law of Attraction, I don't know what is. ESQ: Do you know why is ZZZ such an enduring character? CV: The best people to answer that would be the readers. I'm just the channel. But I've spent many months asking the same question, and the only answer I can come up with is resonance. I think Zaturnnah satisfies our need for the new as much as it holds on to many of the pop culture elements that have sprung up, particularly from the 1980s. One prominent writer told me that Zaturnnah bridges what has worked and what's possible. There's nostalgia, but there's also innovation. And that rang true to me, because I had really wanted to create a bridge between the aesthetic of the classic komiks--along with the melodrama of the 80s film-- and infuse it with my creative influences that are more Western. Of course, there is that appeal of the lonely gay guy who tranforms into a fabulously powerful hero and gets the man in the end. Wish-fulfillment works, too. ESQ: You're busy doing a screenplay too. What can audiences might expect? CV: It's a Pinoy fantasy romantic dramatic comedy that's roughly based on a book. A commercial film, so you're only given so much room. Hopefully those who are familiar with my work will see my stamp in the script. 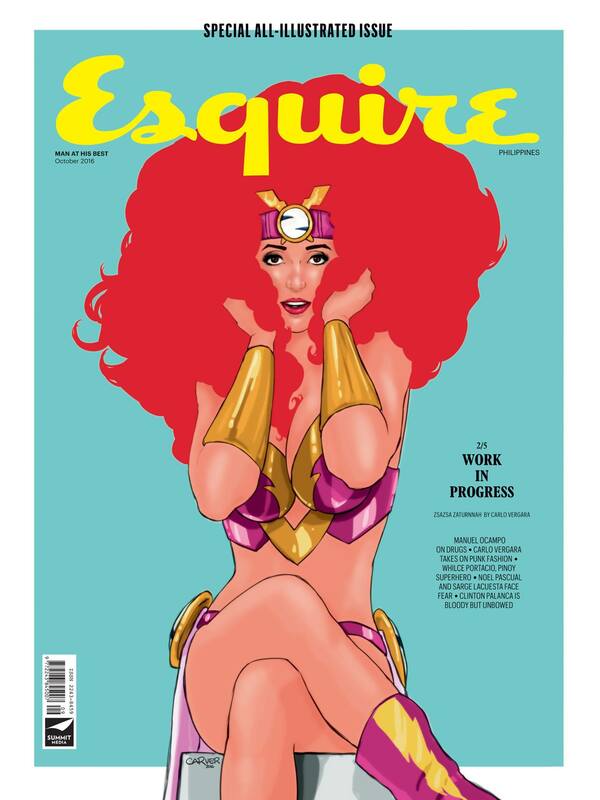 ESQ: When the cover came out, a lot of your fans said 'that'll show the people who said Pinoy comics is dead"! What's your take on the Pinoy komiks scene? Is it thriving or dying? CV: For a number of decades, komiks were the weekly serialized anthologies, the Pinoy Klasiks, the Wakasans, the Hiwagas. When people say that komiks is dead, I believe they were referring to that format. And, yes, I would agree that those komiks are dead, because the format is difficult to sustain today. But komiks as a medium has always been with us. Is the scene thriving? In terms of participation, I believe, yes. More and more people are joining the party. In economic terms, it's hard to tell due to lack of hard data. In cultural terms, the new komiks are making slow but significant steps. Overall, however, I think the new komiks as a cultural force is still in its infancy. There's a lot of opportunities to grow and create more impactful work. I'm looking forward to that day.